Adam Peaty won three world swimming titles, and broke an individual world record. Alex Danson was the player of the tournament as England’s women won EuroHockey 2015. 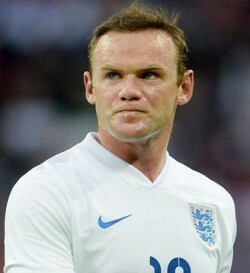 Wayne Rooney broke Bobby Charlton’s all-time England scoring record. 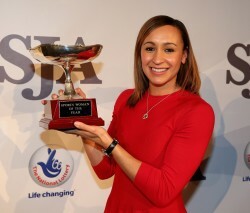 Jessica Ennis: SJA Sportswoman of the Year in 2012. Could she win again in 2015? Andy and Jamie Murray steered Britain to its first Davis Cup final for nearly 40 years. AP McCoy took the jockeys’ title for a 20th time before retiring. Helen Glover and Heather Stanning remain supreme rowing their coxless pairs boat. Greg Rutherford added a world title to the Olympic, Commonwealth and European long jump crowns he already possesses. There’s them, and there’s many, many more top contenders for the titles of the 2015 SJA Sportsman, Sportswoman and Team of the Year, the winners of which will be revealed at a gala ceremony in London on December 17 sponsored by The National Lottery and attended by a glittering array of figures from the world of sport and media. 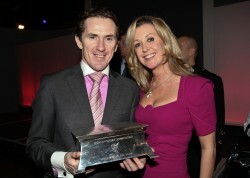 Double winner: AP AP McCoy and his wife, Chanelle, with the SJA Sportsman of the Year award in 2010. Odds-on in 2015, too? And it will be the members of the SJA who decide who are the winners of the longest-established sports awards in this country, in their 67th year, which their Association’s President, Patrick Collins, will be presenting on their behalf. Last year, the leading awards went to golfer Rory McIlroy, runner Jo Pavey and the World Cup-winning England women’s rugby team. The National Lottery presented Dame Kelly Holmes with the Spirit of Sport Award for her work encouraging youngsters into sport through the Dame Kelly Holmes Foundation, and Sir Michael Parkinson presented the SJA President’s Award for one final time, choosing Sir Chris Hoy to mark his outstanding cycling career. Now is the time to choose the winners in 2015, and voting is now open for SJA members. 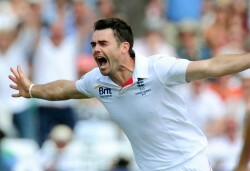 They can vote for their 1, 2, 3 in the Sportsman, Sportswoman and Team categories. The deadline for all votes is Tuesday, December 1. “Please do make sure you use your votes,” Steven Downes, the SJA Secretary, said today. Here is a selection of some of the outstanding contenders for the 2015 SJA British Sports Awards – though it is up to SJA members to choose who they vote for, including those not listed here. “SJA members are spoilt for choice when it comes to voting, yet again, thanks undoubtedly to the impact of funding from The National Lottery on so many of our sports, helping great British talent compete and win on the world stage,” Downes said. Voting forms are being posted out to all SJA members. Or you can vote online now – it takes just a minute of your time.